Welcome to the website for the Metro public transit system in St. Louis, Missouri. Before you take a look at our new website – of which we are very proud – we wanted to briefly provide some context. This site is the result of a year-long effort to create a site that would meet the needs and exceed the expectations of our most important audience – our transit riders. Our old site had issues. While it did not look terrible, it did not have the functionality users really needed. The most important information – maps, schedules and all of the things people need to actually use the system – were buried. Even on the front page. The site also had more than 70 (!) sub-pages of content that was not being properly maintained. It was not mobile friendly. And all of the timetables for our train and bus routes were displayed only as PDFs (!). In short, things had gotten out of hand. So, we went to work. And the site you are on today is the fruit of a collective effort to deliver the best experience possible for transit users and site visitors. We are but a humble transit agency, so we don’t have the budgets or all of the bells and whistles that other websites may have. But, we have created a site with a clean design and intuitive navigation. Mobile-friendly. Offers downloadable PDF schedules and easy-to-use web-based timetables. And, our site has managed to deliver a tangible impact that has produced an outpouring of positive feedback. Below are some of the stats comparing 10 full months of the previous version of the website against the same period in 2017 with the new site. Desktop pageviews increased over 100% from 4.1 million to 8.5 million. The number of users increased overall by 7.6% with 27% of those users being NEW visitors. Bounce rate declined by over 30%. New users on the mobile version of the site increased 16% and mobile sessions increased by 68% to over 2.3 million. Bounce rate from mobile users declined by 32%. Mike M: I think the new website is much much easier to use than the last version. Congratulations on the upgrade. LaWanda W: I like the new website! Streamlined, brighter, bold, simple colors, and easier to navigate. Didn’t like the old one at all. I just needed to look up time schedules for busses it took too long and always showed up under trip planner which I didn’t need. I like the simple list of busses and numbers laid out in front of me and I can just click on it. 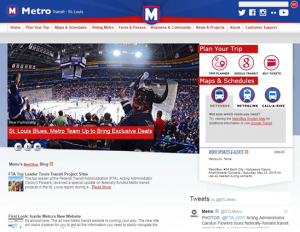 We hope you enjoy the new metrostlouis.org. Thank you for your time and consideration.